Stephen Hickman is best known for his work in science fiction and fantasy, with over 350 book and magazine covers to his credit. His efforts have brought an extra dimension to the stories of Robert A. Heinlein, H. P. Lovecraft, J. R. R. Tolkien, Anne McCaffrey, and Andre Norton. He may be best known for illustrating Larry Niven’s Man-Kzin Wars novels, the Lee/Miller Liaden Universe novels, and the evocative dragons he created for Steven Brust’s Dragaera series, which have often been imitated. His most widely circulated effort is a series of space fantasy postage stamps done for the United States Postal Service. Some of his work has been collected in The Fantasy Art of Stephen Hickman (1989) and The Art of Stephen Hickman: Empyrean (2015). 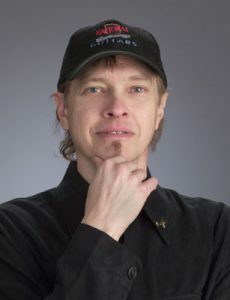 He has been honored with a Hugo Award (1993, for Achievement in Science Fiction and Fantasy), five Chesley Awards and two gold awards from the Spectrum Anthology. Mr. Hickman has tried his hand at writing and illustrating his own work. His novel The Lemurian Stone was published in 1988. In this work, he created the Pharazar Mythos, which has been the basis for several major paintings, including The Lion Pavilion and The Astronomer Prince. See you at Albacon 2018!